The collection, transportation, and storage of blood includes many participants across a variety of global locations. This is relatively mature, as blood donation and transfusion are core activities in clinical and medical environments. What has created a different level of complexity is the increasing use of autologous blood products in the development of a variety of "elixirs of life.” In this case, the critical element includes the chain of identity, with links that collect, transport, cleanse, process, and transform the blood from a single patient. The result — one batch that can only be used by a single individual — is complex and expensive! From identification of patients who might be candidates for these specialized therapies to delivery of the first shipment of drug product, many process steps need to be understood and planned for. In many cases the personnel engaged in the planning and execution of these shipments are not familiar with the intricacies. The initiation point for this critical chain is the clinical location where a patient provides the starting ingredient — their own blood! In many cases, the patients are in a fragile physical state and the scheduling of the blood extraction needs to be coordinated with clinical personnel. This process can be demanding on the patient, and the integrity and cell count of the source material is critical for the development and yield of the drug product. Each of these process steps should be defined in a detailed process overview with data inputs and outputs to enable supply process visibility, intervention in the event of a delay or disruption, and confirmation of secure delivery and receipt of the apheresis and drug product. .
Risk Assessment Is Critical — Plan, Adjust As Necessary, And Monitor! inspection and the QA process — evaluation of excursion data from time and temperature loggers. 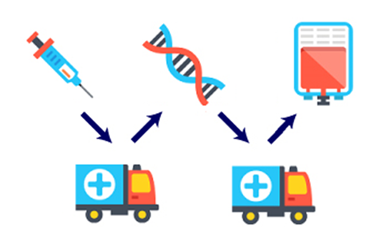 Both the apheresis and the final drug product require stringent control across the chain of custody, ensuring the integrity of the chain of identify. In addition to identification of each key process step across the links in the extended supply chain, it is important to review roles, responsibilities, and reporting mechanisms. Ideally, a single source of data across the product life cycle should provide a digital view of each process step, elapsed time, and successful completion of the batch life cycle. There are a variety of software offerings in this area — commonly referred to as orchestration platforms — to evaluate and eventually integrate into the information systems environment. Access to data across the chain of customer, process remediation, exception notification, and guidance in terms of emergency management and contingency planning also should be planned for. This is truly a critical supply chain. However, the benefits at the end of the journey are worth the effort! Carla Reed is a supply chain professional with more than 25 years of experience providing leadership and program management across a variety of programs for the life sciences industry. Her broad range of experience and expertise has provided solutions for pharmaceutical and biotech companies challenged by the growing complexity of extended supply chain environments. Her firm, New Creed LLC, provides change leadership to facilitate sustainable solutions, providing hands-on experience in all aspects of supply chain operations. You can email her at carla@newcreed.com or connect with her on LinkedIn.